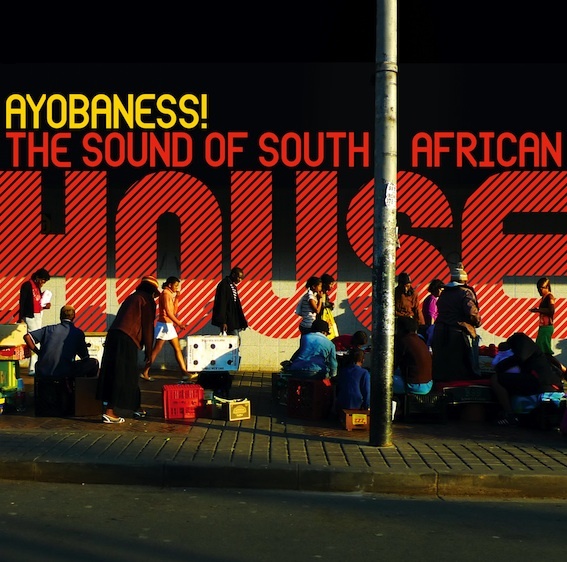 Continuing my tradition of posting “director’s cut” versions of the reviews I freelance from time to time, here’s the latest: a review of a recent compilation from Germany’s Outhere records, Ayobaness!, which showcases the rich, vibrant South African house scene. This one was an interesting endeavor, as my editor, Derek, pushed me to foreground a discussion of the sound (understandably) while I was, as usual, a little more interested in the narrative framework (as offered by the compilers, and beyond). Both aspects are, IMO, crucial to how listeners and practitioners make meaning from these recordings, but short reviews don’t always permit an equal engagement with both. The “director’s cut” below contains two extra paragraphs that couldn’t make the cut for the print edition. An edited version of this review was published in the June 2010 issue (#316). You can preview tracks, place an order, and watch some awesome videos over at Outhere Records. House music’s big tent contains multitudes. And South Africans are no strangers to the show. An early local love of house, from about the same time the UK was embracing and reworking Chicago’s jacked-up disco-tech, famously paved the way for kwaito’s bridging of township rap and house rhythms, serving as suggestive soundtrack for post-apartheid jubilance and impatience alike. South Africa’s affinity for house qua house, however, continued unabated, and expanding access to production and distribution tools has given rise to a burgeoning scene that threatens to reabsorb kwaito, if not offer some course correction for house itself. At a time when metropolitan house variants traverse a global network of labels, clubs, and DJs, South Africa’s convivial mix of soft synths, hard drums, and local vocals should find plenty of complimentary grooves to slip into. Ayobaness! The Sound of South African House, a new compilation from Germany’s Outhere Records, makes a strong case for South Africa as a hotbed for the genre. Thanks to YouTube’s projection of township youth cutting asphalt rugs, tracks by such standouts as DJ Mujava, represented here on the rollicking “Mugwanti / Sgwejegweje,” have recently enjoyed eager uptake abroad, mixed and remixed into the kindred forms of UK funky, dubstep, electro. While some of the scene’s biggest tracks are off-kilter instrumentals with spooky synth leads and chunky percussion, Ayobaness! highlights vocal numbers. Male and female voices mix judiciously, as do the forms they take, from raspy rap verses to sweet, full-throated call-and-response choruses. In contrast to a lot of house tracks, even of the diva-propelled variety, the tracks collected here sound a lot more like songs. Spiky riffs, needling leads, and fuzzy washes interplay with snare drum cross-rhythms, bongos for days, and a panoply of voices. Take DJ Cleo’s “Nisho Njalo,” which dresses up house’s four-four kicks with a clave-shaped tom-and-piano riff, some laser beam skanking, interlocking synth melodies, and polymetric percussion rolls while kwaito sensation Bleksem recites coquettish rhymes to a skeptical chorus of women. This level of density and detail, conjuring local and global tropes all the while, is utterly typical. Despite the music’s uniqueness, the sound of South African house is not so much a product of peripatric speciation as it is an aesthetic committed to local style while audibly attuned to contemporary currents in the wider world. The detailed liner notes boast that the scene has “deep, tribal, electro and minimal” sides, and discerning listeners will pick out nods to various tropes of the genre, old and new. The convivial mix of synths and skins is enough to win one over; no need to be cute and call this “shanty” house, or dub it the “most crazy house culture in the world” as it has been promoted. Ayobaness! continues a line of releases from Outhere portraying African popular music that is, you know, actually popular (not just what might best fit outsiders’ expectations of African difference). From bongo flava to hiplife to roots reggae, Outhere’s compilations help to round out a picture of what contemporary urban Africa sounds like, including how much it sounds like the rest of the world. Amidst the ongoing Afrodiasporic jam across the Net Atlantic and a growing interest in African club sounds like kuduro and coupé décalé, the sound of South African house should resonate widely, but it’s best embodied on its own sure-footed terms.